The project is at substantial completion and staff is working with the contractor on final punch-list items. At the Tom Frost parking lot, installation of parking lot landscaping, a trailhead kiosk, and port-o-let enclosure are scheduled to be completed summer 2019. We again want to thank everyone for continued patience during this project. Even though the contractor has been well ahead of schedule, we realize the ongoing construction zone can be difficult. The City and County of Broomfield and contractor Concrete Works of Colorado (CWC) started construction on the the Lowell Boulevard North Improvement Project in March. This project is the final of seven projects identified in the 2006 Internal Transportation Improvement Program plan. PHASE I (West side of Lowell & Tom Frost Parking Lot): Improve all drainage & utility, road & sidewalks, and traffic signal changes from 136th Ave. to East Midway. Anticipated completion OCTOBER 2017. 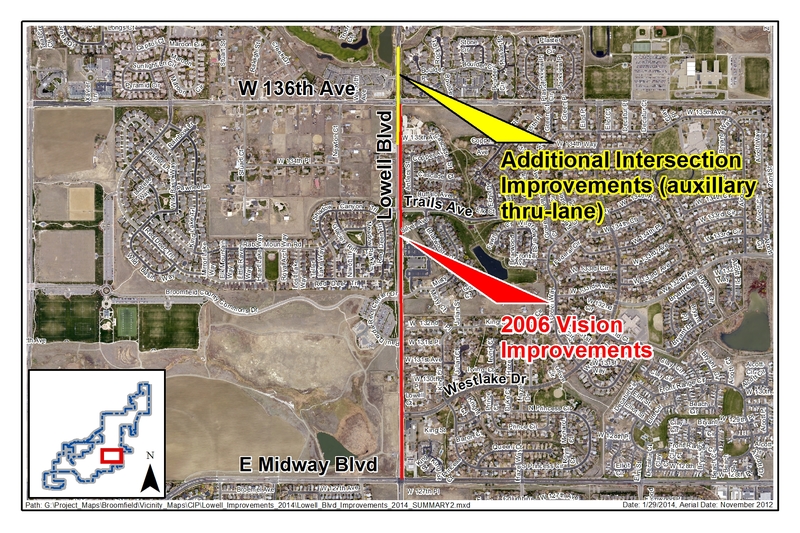 PHASE II (East side of Lowell and Median): Improve all drainage & utility, road & sidewalks, and remaining traffic signal changes from 136th Ave. to East Midway. Includes the final surface paving & marking of the entire project. Anticipated completion JUNE 2018 OCTOBER 2017. The project zone will post a lower speed limit for the safety of everyone, and during non-peak travel hours (9 a.m. – 3:30 p.m. ) traffic flagging operations will be encountered. This may add up to eight minutes to travel time through the project. Intersecting streets and business entrances will remain open during construction. Any short term access closures will be coordinated in advance with affected businesses and residents. ** These files are large and may take a while to load. If the files do not open, try a different browser. The overall vision concept and need for the project was set by Council in the 2006 Internal Transportation Improvement Program plan. The 2006 project vision concept sketch and major project elements are shown above. Addition of a second southbound through lane starting 1,000 feet north of West 136th Avenue and extending past the West Metro Fire Station south of West 136th Avenue. The addition of a second southbound lane, as shown below, will improve the north and south operation of Lowell at West 136th Avenue through the 2035 design horizon. In February 2014, Council reviewed this project scope and awarded a consulting agreement to Merrick Engineering for final design and to prepare construction documents and plans for bidding. In January 2017, after receiving bids from nine interested and qualified general contractors, Council awarded a construction contract to Concrete Works of Colorado (CWC). The contract, in addition to the Lowell road work, also includes relocation of the Tom Frost Reservoir parking lot, and completion of neighborhood entry signs and monuments for the Westlake neighborhoods. CWC will begin work in March. The many components of the project along the one mile corridor will be constructed over a 18 month period. Please be sure to sign up for Lowell Project email updates at the top of this page. Comments or questions? Please email Noreen at ngardner@broomfield.org.